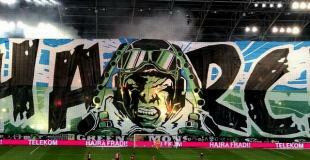 Ultras-Tifo: HI Hugo, please first introduce you and your function in your group and your exercises! My name is Hugo, I'm 22 years old. I'm a member of Frente Leiria since the beginning of the group. In the season 2003-2004 I was also a member of Frente Leiria "diretivo". Nowadays, I don't have responsibilities inside the group and I do whatever member should do: go to as many games as possible and help whenever is necessary. Hugo: For almost half a decade, União de Leiria didn’t have a well organised and constant support. There was a need to bring young blood to the stands and to grow some pride in Leiria’s youth towards their local football club The debut of Frente Leiria was in the 8th September of 2001. The match opposed UDL against Sporting Clube de Portugal. In this first match, FL gathered more than 200 supporters in the stand. In that same season, FL was considered the «revelation ultra group» in the Portuguese Ultra scene Some good tifos and good attendances in away matches, immediately established FL in the Portuguese terraces. Despite this amazing growth, FL suffered an almost lethal setback. Due to the new stadium’s construction, UDL was forced to play its home matches in a town nearby, Marinha Grande. With the team playing outside Leiria, every single match was an away match. This fact brought severe consequences to a group that was yet to «fresh» to deal positively with this tragic situation. Never the less, a strong and united group among FL managed to get hold of the group and kept it tight. As a «reward» to these events, the team in 2003 got a place in the final of the Portuguese Cup with UEFA CUP winners, FC Porto. the group managed to be in the National Stadium to attend to the final. 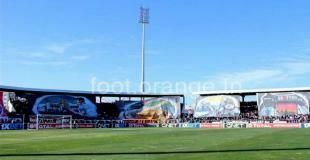 Almost 300 ultras supported the team until the very last minute of the game. the season 2003/04 was definitely a turning point in FL’s short history. The main cause for this sudden change was the opening of Leiria’s new stadium. A very modern and functional structure built to receive some matches of the Euro-2004. Nowadays the «house» has got new management. Last season, the support in our stadium and elsewhere was very good. And there is a generalized feeling that we can create a new sense of mystique in the club and in its people. UT: The scene in Portugal is dominated by the groups of FC Porto,Benfica and Sporting. Also many people from the villages follow the big teams ,perhaps you could explain this situation and why you follow your team and how is the position of your group between this groups? Hugo: In Portugal there is the strange habit of supporting one of the three biggest teams in the country, Benfica, Sporting and Porto. There are very few exceptions to this sad scenario. Portuguese people tend to support only the wining clubs. In fact there are people who support the local football club and have a strong passion for one of the biggest teams. In my opinion, this is due to the fact that Portugal is a quite small country (geographically speaking) so it’s very easy to go to that clubs’ stadiums. Another reason for this situation is the presence of countless “sections”(in Portugal we called it houses or núcleos) throughout Portugal which congregates the fans from those clubs who live very distant from their clubs. In Leiria the situation is critical. Almost nobody loves their local football team, it’s really sad indeed. Because Leiria is situated no more than an hour and a half by car from Lisbon or Porto, people prefer to travel around than to go to Leiria’s stadium. União de Leiria is also the youngest club in the Portuguese premiership therefore isn’t much a mystique towards and in the club and since it has won nothing, it’s harder to bring people into the stadium. I follow my team because I’m proud in União de Leiria, I’m proud to have born in this city and me and my friends don’t give a **** (excuse me for my French) for those people of Leiria who couldn’t care less to União de Leiria. Almost everybody in Frente Leiria was motivated to go to the stadium because of one of their relatives. So it’s not unusual, especially in away games to see fathers, grandfathers and sons along in the same stand. We are few but loyal. UT: How is your relation to the big groups and who are your ennemies? Hugo: We respect everyone who respects us. We never had troubles with the bigger groups. Nevertheless, we have a rivalry with Mancha Negra (from Académica de Coimbra) because of the proximity between the two cities. Due to a coward attack perpetrated by Panteras Negras (from Boavista) they are now the group that we have the worst relation with. UT: If we ask for the ennemies we also want to know about friendships or good contacts? Hugo: Being in FARE network is not some kind of ideology that every member of the group has to follow. Far from that. Many of the biggest football players in União de Leiria recent history were black, so we feel that we should respect these players because at the end, we do not want them to be insulted in other stadiums. It’s a question of citizenship and tolerance. In Frente Leiria the political thought of the individuals doesn’t matter, from left to right, as long it does not interfere in the group mentality. UT: For the most clubs the City is very important for their mentality and their style, it´s the same in Leiria, and what is the different between people from Leiria to people from Porto or Lisboa ? Hugo: Nothing really changes. Portugal is a very homogeneous country in the way people think or act. Although northern people are more known to be more fanatic and enthusiastic. UT: Ultras have often sometimes daily to do with repression by the government, FA etc. , how much you have to do with repressions and how do you fight against repressions ? Hugo: In Portugal there is a law called 16/2004. It’s more less like tha Diffide Law in Italy. Since this law is active, many groups have started to pay enormous fees for its actions. The law is very strict and the police is ruthless towards the organized supporters’ groups. We already were fined under this law but that doesn’t stop us to do what we love most: to support União de Leiria. 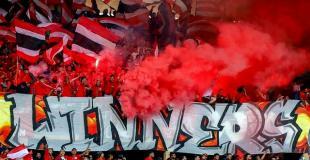 UT: In many cases Ultras have to with incidents and riots, your group too ? Hugo: No, not at all. Our way of being in football does not include confrontations and fights. Only, lots of alcohol, singing, travelling, friendship and of course UNIÃO DE LEIRIA. Hugo: Like many others Ultras Groups, we have a “diretivo” that controls all the aspects related to Frente Leiria. There are some sections in order to facilitate the group organization. We are always whwre the team plays, however e don’t go to the islands of Madeira or Açores for two years due to high prices of airplane tickets. UT: How much is your influence in the club and how is the general relation to them ? 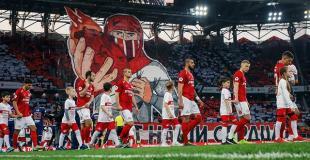 UT: How did you finance your group tifo´s ? Hugo: Through the money each member pays for belonging to the group when they are registered in Frente Leiria; through the sale of the groups material, like scarves, hats and so on; and through some events made by Frente Leiria like concerts or football tournaments. Hugo: In Portugal the support is almost completely based in the Italian Ultra Style. The biggest groups belong to the also biggest clubs. But some groups are getting better and better and I’m not just talking about quantity. I mean a very good quality of Tifos and actions in the various Curvas. Even in the secondary leagues there are many groups turning up which is an excellent sign of how good is becoming the organised Ultras movement in Portugal. Hugo: It’s almost impossible not to be influenced by foreign examples, but in Frente Leiria we try to create our own way of being and acting. Nevertheless, there is a predominance of the Italian Style. UT: Every group have targets for the future, what FL aim in the future ? Hugo: We want more people to come to the stadium and sing along us, to motivate young people to be proud in their local club and to ensure a future where the organised support will not disappear again from Leiria Stands. Thanks a lot for the Interview, and the UT-Crew wish you luck for the future.